Use this mockup form Placeit to help you advertise your business ideas, promote a campaign or to showcase your latest product. 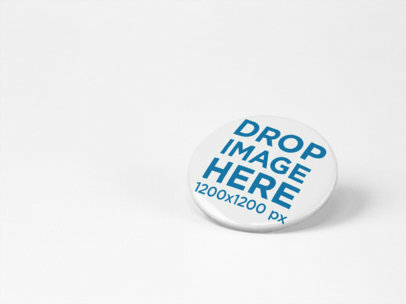 This pin mockup features a set of pins lying on top of each other over a flat surface. Customize this great mockup today by simply dragging and dropping an image of your choice onto the template and catch your potential consumers attention right away! What are you waiting for? Start using mockups as part of your visual marketing campaign and make your ideas look beyond amazing starting now! 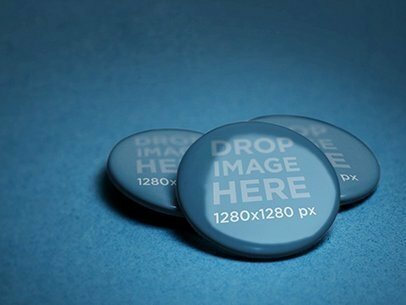 Have a look at this template of a big button lying on a solid surface, it's a really cool visual asset that you can start using to make your revenue grow! All you have to do is drag n' drop a jpeg or png file on the interface, we will merge it for you in just seconds. Start now and make your income grow! Try another Button Mockup here! 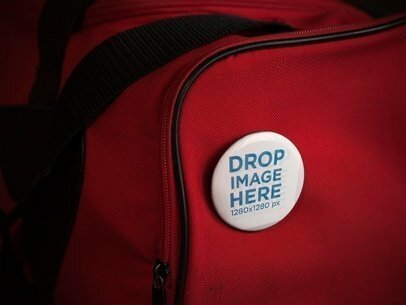 Showcase an awesome design or logo with this mockup of a button on a red gym bag. It's a great option for you to display a logo or design in a creative and photorealistic way. Start now! All you need to do is drag-and-drop your image design on the interface, we will process it for you in just seconds. Make your income grow with Placeit! Try another Button Mockup here! This stationery mockup features three pins sitting on top of a plain background. Use this image as part of your visual strategy to help you showcase your business recent ideas in a unique, up-to-date way. 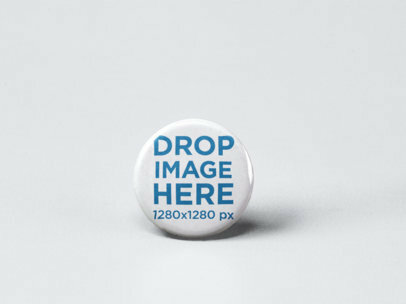 All you have to do is choose an image of whatever is that you want to advertise, then drag and drop the image on the pins in the template and Placeit will do the rest. Get authentic visual assets within no time! 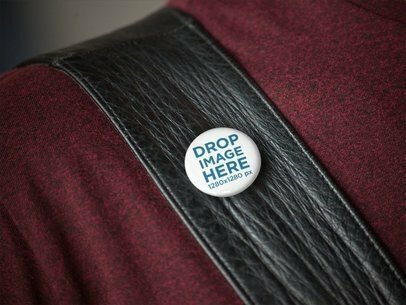 This pin mockup could be just what you need, so don't think about it twice and make Placeit an essential part of your marketing campaign today! 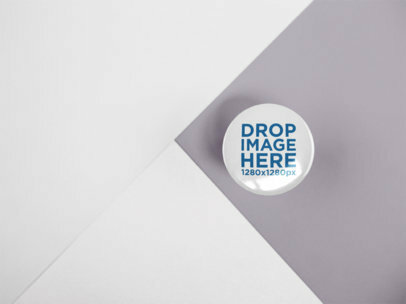 Check out this awesome mockup of a small button standing on a solid surface, it's a really cool visual that you can start using to promote your designs! You can not only choose the background color that you like the most, you also have to just drag n' drop a jpeg or png file on the interface to put your design on this button. After a few seconds you'll see it merged. Start now and make your income grow! Try another Button Mockup here! This branding mockup features a two pins lying together over a solid background. Use this creative image to help you display your new design or ideas to the world and leave a lasting impression on the market. This great mockup could work for you to showcase pretty much anything you can think of, which makes it the perfect visual marketing tool to use. To personalize this mockup just input a URL address or drop an image onto the template, it's as simple as that. Don't forget that the background on this template will change in order to adjust itself to your chosen image color! Pretty cool right? Make your income grow with Placeit! Use this awesome template of a man wearing a shirt with pink and blue squares with a button above his left chest pocket now and sell more. All you have to do to merge your design with the button is drag-and-drop your image design on the interface, we will merge it for you in just seconds. Try another Button Mockup here! 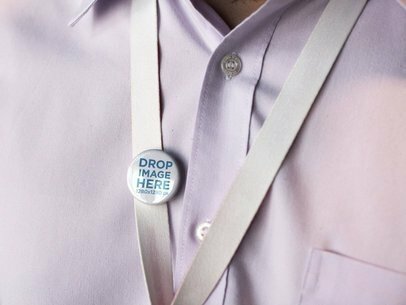 Check out this gorgeous mockup of a small button on an executive's white badge-holder. He has a light purple shirt. It's a really beautiful visual option that will make your logo or design stand out, display a professional image with Placeit. Start now by dragging and dropping your jpeg or png file on this interface, we will merge it for you in just seconds! Try another Button Mockup here! 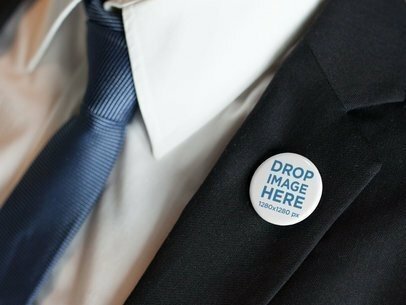 Check out this awesome mockup of a button on a white man's black suit. It's an excellent option for you to promote your business logo or design. Start now and make your corporate audience increase! They'll make your revenue grow, all you have to do is drag-and-drop your image design on the interface. After a few seconds you'll see the result image on the screen. Isn't Placeit great? Try another Button Mockup here! Start showcasing your awesome designs or logos with Placeit's beautiful mockups! All you have to do is drag-and-drop your image design on the interface, it'll be automatically processed. A few seconds after that you'll see it on this button, it's lying on a wooden surface. Isn't Placeit awesome? You get beautiful and professional images in just seconds. Try another Button Mockup here! 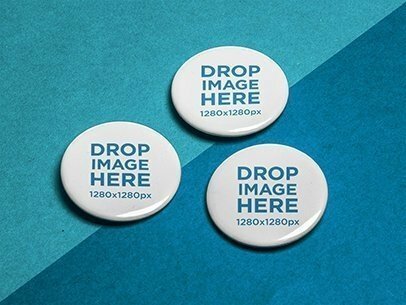 Start showcasing your amazing logo or design on a button with Placeit's beautiful templates. This one is featuring a button on a leather bag strap, carried by a guy with a dark red heather sweatshirt. Start now! All you have to do is drag-and-drop your image design on the interface, we will process it for you in just seconds. Make your revenue grow with Placeit! Try another Button Mockup here! 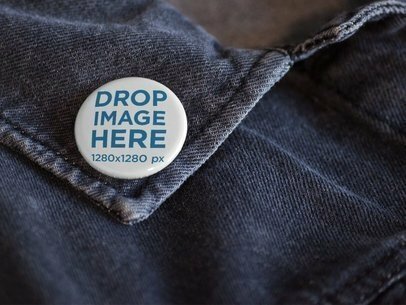 Showcase a logo or design with this beautiful mockup of a button on a dark denim jacket's collar now! It's a professional and visually attractive image that will make your design stand out immediately. All you have to do to merge your design with it is drag-and-drop your jpeg or png file on the interface, we will show you the processed image in just seconds. Make more money with Placeit! Try another Button Mockup here! 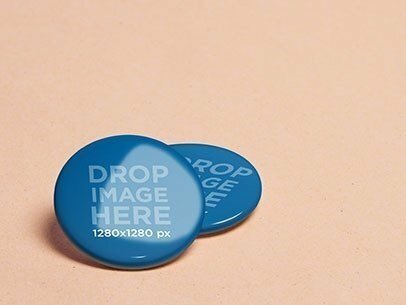 Display your most awesome logo or design with this template of a little button lying on a solid color surface, it's a great option for you to promote your ideas! Choose a color that'll make your design stand out, drag-and-drop a jpeg or png file on the interface and make your income grow! Start using Placeit for professional and beautiful results. Try another Button Mockup here! 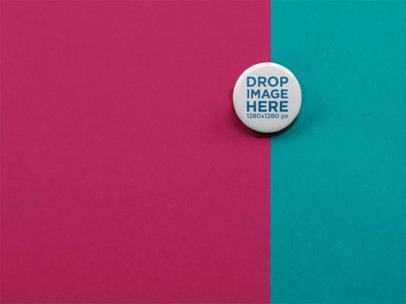 Take a look at this mockup of a small button lying on a surface made out of two colors, choose the combination of colors that suits your design the most! Start now using Placeit and make more money selling your designs, all you have to do is drag n' drop a jpeg or png file on the interface, we will merge it for you in just seconds. Start now and make your revenue grow! Try another Button Mockup here! Have a look at this mockup from Placeit! 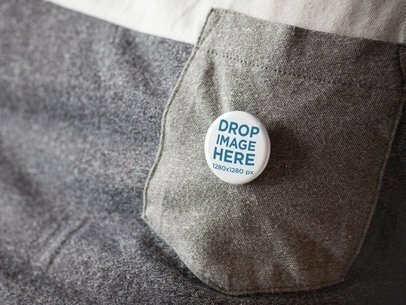 It features a small button lying on a flat surface, it's a really good visual asset that you can use to promote your brand in a smart and colorful way! Choose a background color combination to enhance your design, drag-and-drop a jpeg or png file on the interface. After a few seconds you'll see the finished image on your screen. Awesome, right? Try another Button Mockup here! 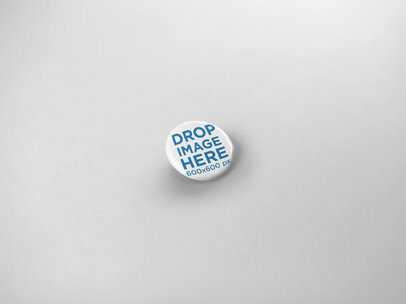 Check out this awesome button mockup from Placeit! It has a small button lying on a surface made out of three colors, you can choose the combination that you like the most to make your design stand out. Start now by dragging and dropping a jpeg or png file on the interface, it'll be automatically processed. After a few seconds you'll see your finished image on your screen. Amazing, right? Try another Button Mockup here! 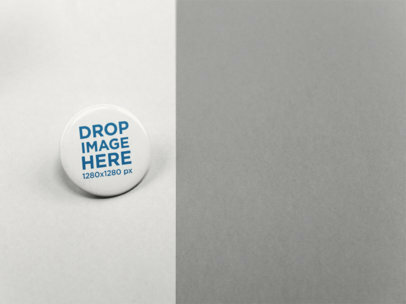 Have a look at this awesome mockup of a button lying on a solid color surface, it's a really cool and versatile image that you can start using to showcase your designs in a creative and professional way! Start now by dragging and dropping your image file on the interface, we will merge it for you in just seconds. Use Placeit and make your revenue grow! Try another Button Mockup here! 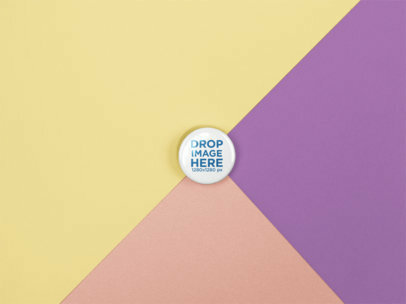 Have a look at this big button standing on a bi-colored surface, it's an awesome visual asset that you can start using if you are looking to promote your design or logo in a smart and beautiful way! Start now by dragging and dropping your image file on the interface, we will merge it for you in just seconds. Use Placeit and make your income grow! Try another Button Mockup here! Showcase your awesome designs using Placeit's beautiful visual assets! They are all you need to make your revenue grow day by day, just drag-and-drop your image design on the interface, it'll be automatically processed in just seconds. Start now! 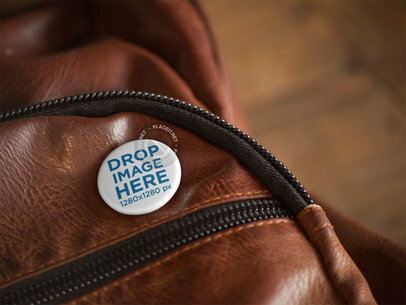 This mockup features a button on a black leather backpack, right beside the zipper. Try another Button Mockup here! 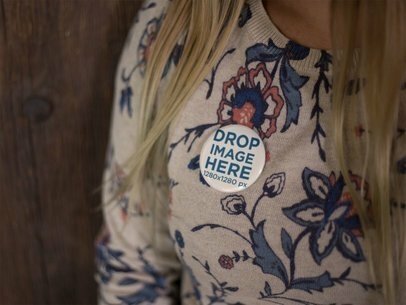 Check out this awesomely made mockup of a white girl wearing a worn-out denim jacket with a button near its neck. It's a great option if you are looking for powerful visual assets that will help your designs stand out! Start now, all you have to do is drag n' drop an image file over the interface, it'll be automatically processed. After a few seconds you'll see your design on the button, isn't Placeit great? Try another Button Mockup here! 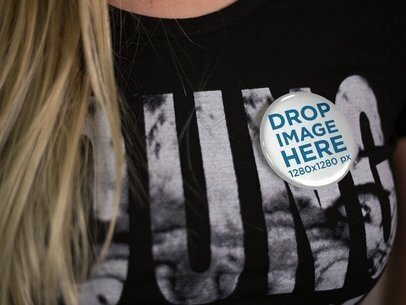 Showcase a logo or a beautiful design on this button on a blonde girl's black tee, it's a beautiful image that will make your design stand out! All you need to do is drag-and-drop your image file on the interface, sit back for a couple of seconds and see how your image is merged with this girl's button. Display this image to your audience and make your revenue grow! Try another Button Mockup here! Start displaying your stunning designs with Placeit's awesome mockups! This one features a button on a man's sweater while he's having a coffee with a red mug. Start now and make your revenue grow! All you have to do is drag-and-drop your image design on the interface, it'll be processed it in just seconds. Beautiful images will make your income grow day by day! Try another Button Mockup here! 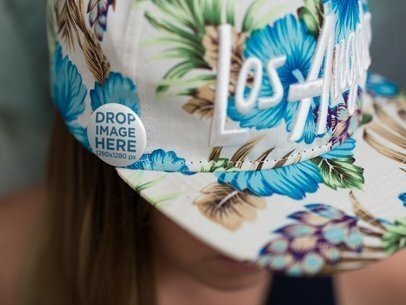 Check out this awesome mockup of a blonde girl wearing an LA snapback hat with a button on it, it's a really cool visual asset that will make your designs stand out! All you have to do is drag-and-drop an image file on the interface, we will merge it for you in just seconds. Start using Placeit now and make your revenue grow! Try another Button Mockup here! 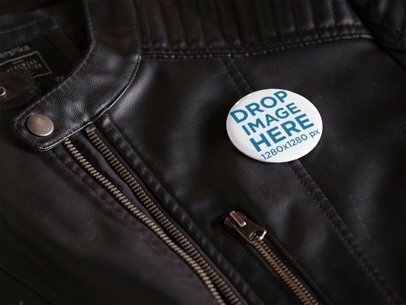 Check out this awesome mockup of a button on a leather jacket, it's a great choice if you are looking to showcase a beautiful logo or design in a button with a professional and photorealistic image. Put your image file on this interface by dragging it and dropping it, after a few seconds you'll see it merged with the button. Try another Button Mockup here! 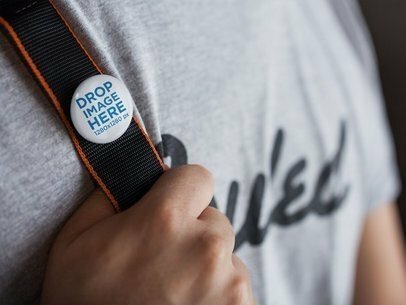 Check out this awesome mockup of a button on a young man's backpack strap, it's black with red lines and he's also wearing a gray heather t-shirt with a black text on it. It's a great mockup for you to showcase your latest designs in a creative and professional way. Use this mockup now! All you have to do is drag-and-drop your image design on the interface, we will process it in just seconds. Try another Button Mockup here! 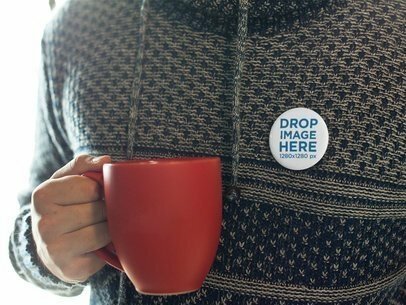 Check out this awesome mockup of a button on a blonde secretary's blue suit, she's carrying a small notebook in her hand while wearing the company's button. It's a great choice if you are planning to promote your corporate image. Start now! You just have to drag-and-drop your image file on the interface, it'll be processed in just seconds. Try another Button Mockup here! Showcase your awesome designs with this beautiful mockup of a little button on a blonde girl's crewneck while she's lying against an old and dark wooden wall. It's a great option for you to promote your designs in a professional and creative way. 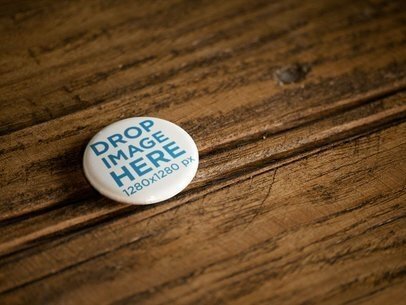 Drag and drop your image file on this interface, we will merge it with her button in just seconds. Create engagement in your audience with Placeit! Try another Button Mockup here! Start promoting your brand or logos the right way, use Placeit! All you have to do is drag-and-drop your image design on the interface, we will process it for you in just seconds. 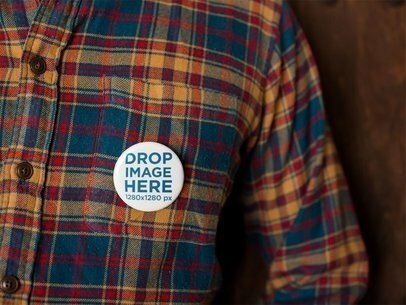 This awesome mockup features a button on a lumberman's shirt. It's a great choice to put your design on. Start now and make your revenue grow! Try another Button Mockup here! 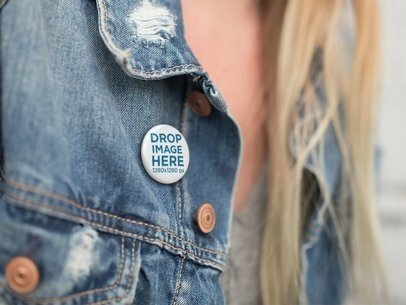 Check out this awesome mockup of a button on a woman's denim jacket, it's on the chest pocket showing your design's awesomeness. Get started by dragging and dropping your image file on the interface, we will process it immediately! After a few second you'll see the design merged with the button. Isn't Placeit great? Try another Button Mockup here! 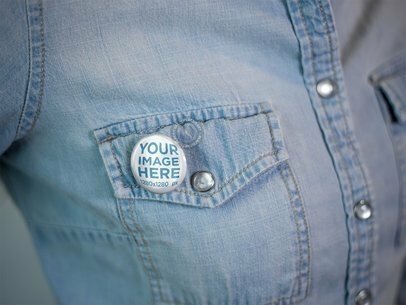 Check out this mockup of a little button on a t-shirt chest pocket! It's an amazing option if you are looking to be creative and professional at the moment of making your brand stand out. Start now and make your revenue grow with Placeit! All you have to do is drag-and-drop your image design on the interface, we will merge it for you in just seconds. Try another Button Mockup here! Make more sales with your designs right now! How? Use Placeit, it's that simple. 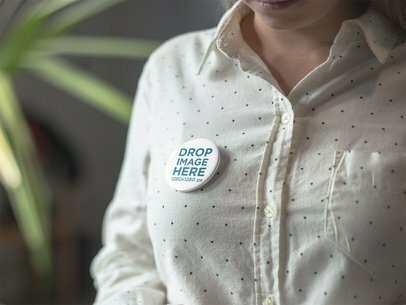 Put your design on this mockup of a button on a young woman's white shirt with black dots, she's texting. All you have to do is drag-and-drop your image design on the interface, we will process it in just seconds. That's right, that's all the work you have to do. Grow your revenue now! Try another Button Mockup here! Start showcasing your most amazing designs using Placeit's visual assets. 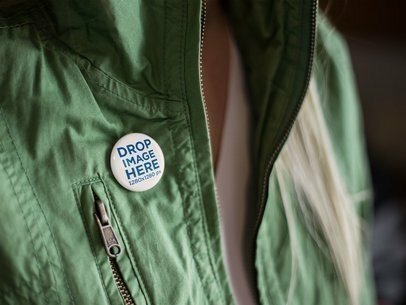 This mockup features a button on a girl's green jacket, it's a really good option if you are trying to promote an amazing design! Start now, all you have to do is drag-and-drop your image file on the interface, we will process it in just seconds. That's right, you won't even have to open Photoshop! Try another Button Mockup here! 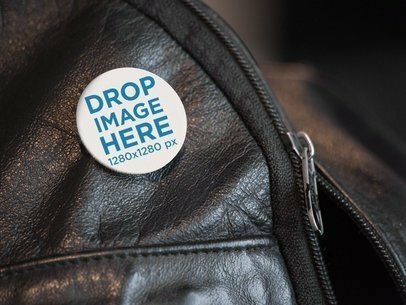 Showcase your awesome design with this template of a button on a leather backpack! It's an awesome choice if you are looking to display your designs in a creative and professional way. Start now and make your revenue grow with Placeit! Photorealistic images make your customers have a higher affinity for your brand. Try another Button Mockup here! Improve your visual marketing with Placeit! 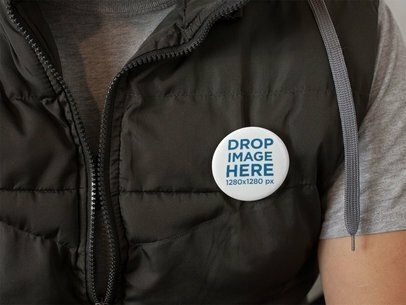 All you have to do is drag-and-drop your image design on the interface, we will mix it for you with this awesome mockup of a button on a mans black vest. Start now! Make your income grow. Try another Button Mockup here! 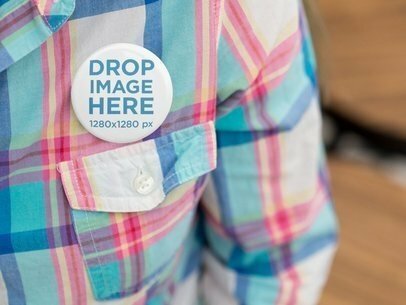 Showcase your most awesome button designs with Placeit! All you have to do is drag-and-drop your image file on the interface, we will process it for you in just seconds. Start now! 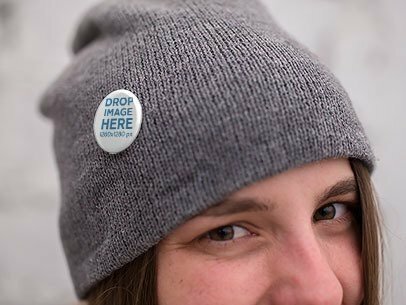 This mockup features a white girl smiling while wearing a button on a gray beanie of her. Realistic mockups will make your audience engage with your brand. 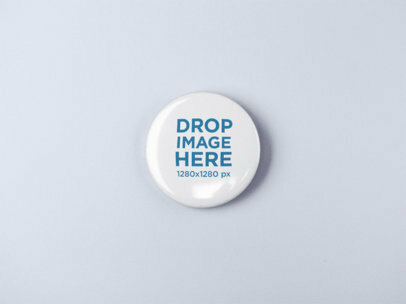 Try another Button Mockup here!